The 34.14 metre motor yacht Second Love, listed for sale by Chris Daves at Denison Yacht Sales, has been sold with John Varga at Westport Yacht Sales introducing the buyer. _Second Love _was built in GRP by US superyacht yard Westport Yachts to a design by Jack Sarin and delivered in 2009 as one of the yard's Westport 112 series with a refit in 2013. Powered by twin 2,000hp MTU 16V 2000 diesel engines, she reaches a top speed of 26 knots and cruises at 24 knots. She has a fuel capacity of 5,500 gallons, providing for ample range. 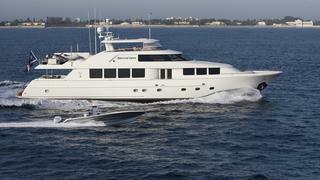 She is one of the most highly customised yachts in Westport’s semi-custom 112 series. This includes a custom layout on the flybridge, with an owner-requested hard top, a drop-down custom 42 inch HD Toshiba television, bar, Jacuzzi, lounge seating and plenty of space for water toys. She differs from her sisters inside as well, featuring interior design by Robin Rose & Associates who have used cherry wood joinery, bespoke onyx finishes, and custom soft furnishings, window treatments and wall coverings. The custom details don’t stop there, ranging from her brand new Fabrica carpeting to the custom brushed nickel hardware. She accommodates eight guests in four cabins and has crew quarters for five crew members. The master bathroom boasts a steam shower, mother of pearl wall coverings and onyx details and flooring. Guests are accommodated in a VIP suite and queen and twin berth cabins, all with en-suite facilities. Second Love was asking $7,750,000.